Noi Bai International Airport services Hanoi, the capital city of Vietnam. The Terminal 2 building, opened in 2015, handles all international flights to Hanoi while Terminal 1 is for domestic flights. This Noi Bai International Airport guide has important airport contact details, along with information about airport terminals, transportation options, and nearby hotels. An information desk is conveniently located close to the check-in desks on the third floor of Terminal 2. For arriving passengers, there is an information desk in between the two exit doors on the first floor in Terminal 2. From downtown Hanoi, drive east to join Võ Chí Công which becomes Võ Nguyên Giáp, then follow the airport sign. The drive time is approximately 40 minutes. There is a free shuttle bus for transit passengers. Noi Bai International Airport is located 45km (28 miles) north of the city centre. Bus: Buses number 7, 17 and 90 connect Noi Bai International Airport with the city centre. The buses stop at both terminals. A ticket costs 5,000 VND and the journey is about an hour. Buses run every 15-20 minutes from 0500 to 2200 hours. Minibuses take you directly to your hotel or residence in Hanoi. Always confirm destination and fare before boarding the minibus. Minibuses do not leave the airport until they are full. Coach: Coaches are parked in front of both terminals. The basic fare to the city centre is 40,000 VND. Baggage is free of charge. Taxis: 14 taxi firms operate at Noi Bai International Airport at both terminals. The fare is charged according to the taxi metre. There is no rail system that services this airport. The nearest local train station is Ga Đa Phúc, about 9km (6 miles) away. There are currency exchange facilities at Terminal 2. ATMs of local Vietnamese banks are available at both in the arrival areas. There are numerous restaurants and dining options, most of which close at 2300 hours. Duty-free shopping, souvenir shops and other retailers are available at the airport. There is a lost-and-found counter on the first floor of Terminal 2, while left-luggage facilities are available on the second floor. Other facilities available at Hanoi International Airport include a baby care room, children’s play areas and medical services. Showers are available in the business lounge. There are no conference facilities in the Noi Bai International Airport but the business lounge offers basic business facilities. Free Wi-Fi internet access is available throughout both terminals. Disabled facilities include ramps, escalators, adapted telephones and toilets. There are vehicles available to transport people with reduced mobility. For special assistance, passengers should contact their airline operator in advance. Outdoor parking is available for short and long stays. 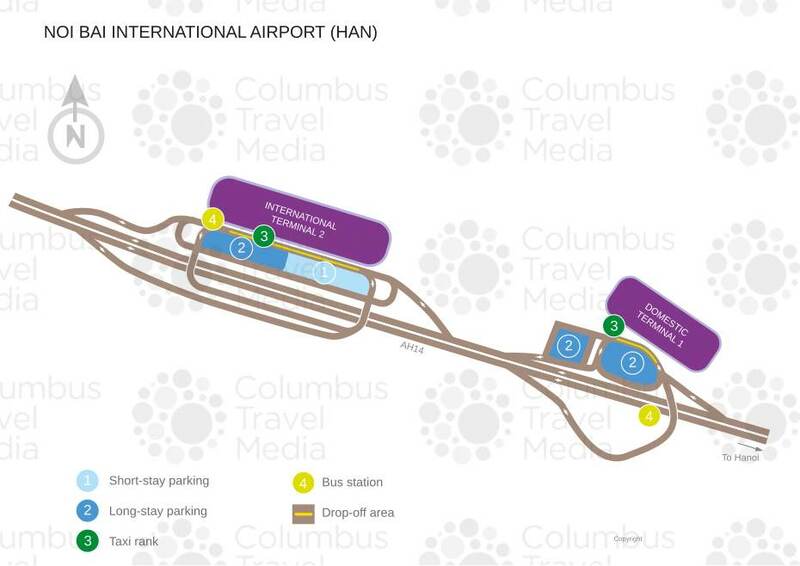 The car parks are located opposite the terminal buildings. There are different parking zones depending on the length of stay, with different rates. Car hire companies represented at Hanoi International Airport include Avis, Budget, Europcar, Hertz, and Sixt.